Got some love today by Indy.com. Check out the article. Throw up some feedback. Taffy tells me that people still tell him that branding is BS. What do you think? Branded for Life – Is branding more than a logo? Funny little story about branding. I’m branded. 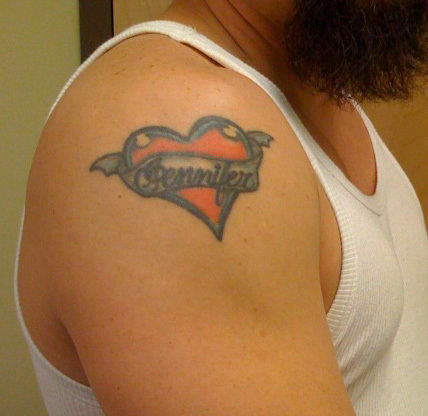 I have a classic heart tattoo with my wife’s name on my right arm. It’s cliche but I love it. “But what if you do?” he asked. “I’ll cut my arm off,” I said jokingly. But that’s not true. I would rather cut my arm off then lose her. Anyone that knows me, knows this is a fact. I’m branded for life. So you want a brand? You want an online/offline identity that people can trust, easily recognize and bring forth an emotional connection with your customers. You want to have something bigger than yourself or your company’s name. So you get a logo. There’s no reason to pay the big bucks. Your cousin or a friend of a friend said they could do it for virtually nothing. That’s great. I can’t believe those big marketing guys blow so much on something so simple. How hard is it to pick a design, some colors, a typeface and a tagline? This is a joke, you think, anybody can do this. Man, I should go into marketing or advertising. This branding stuff is such a scam. Then you start using your logo. Make it small and stick it on your Twitter profile or maybe on Facebook. Can I embed this into my email? I should get some T-shirts. People would so want to wear my logo. Nike, Harley-Davidson, Apple, and me. Well, maybe not everybody but I could totally make my employees, family and friends wear it. It’s going well for a little while. You use the logo in your print, broadcast, billboards, website, banner ads, email, packaging, POS material, newsletters, brochures, business cards, PR, civic involvement, trade show exhibits. It’s everywhere you are. People start recognizing your brand because you are putting it with everything you do. You are delivering on the brand promise, sort of. Sometimes there are things that people want you to do that may not match exactly what you say in your tag. You wish you would have phrased it a little differently so you can incorporate these other things you like to do or need to do. Oh well, maybe next time. But then, because you are a brand and out in the public eye, someone calls you out on not following your brand standards exactly. Big deal. This guy is just jealous because he doesn’t have a brand. Blow it off. They will go away. Oops. Another issue. Can I really follow what I’ve told the world I would do? Am I eroding their trust? Is my brand true to me? Your brand is suddenly a lot more than you thought it would be. And in an online world, it can be so much more. Back in the day, it was harder for people to respond directly to your brand. Now, they can define it for you especially if what you are doing doesn’t match the brand you tried to set forth. Thus, defeating the entire purpose of putting a brand out there. Brand is so much more than just a logo, tagline, mission statment and color scheme. It offers your unique benefit, it can personify your company’s products/services, it evokes an emotional connection with your customers and it definitely helps deliver on your company’s promise. And you are going to leave it up to a freebie logo and color scheme from a buddy? You need someone to ask you the hard questions. Are you really this brand? Do you deliver on this promise every time? How does your brand compare to your competition? Can you live with this brand forever? Is it timeless? When no one is there to explain why the logo does this funny swish thing, what emotion does it bring to the viewer? Check out www.brandtag.net to see what people think when they see a logo? You may be surprised. A Brand helps your customers evolve from knowing you, to preferring you, to being loyal to you, to being your evangelists. The moral of the story is don’t skimp. Because if you do, soon you will be disappointed and you’ll want to change it. And all the brand equality you’ll built will be damaged plus the expense of replacing your logo and tags. MediaSauce doesn’t care if you use us or someone else. Just make sure they understand what they are doing – that they take the time to research your logo/design (I have a lovely story of company that went through an entire process of discovery/design to find out they chose an almost identical logo and tag of a completing company in their industry – something the branding company should have ruled out in the first place). Remember your brand can be as great as your right arm. Don’t put it out there unless you are willing to live with it for life. Marketers, want to save your job and the company? Use real customer service. Several things happened last week that made me take notice. And since I don’t believe in coincidences, I had to pull it altogether in my mind. First, an amazing client story. J.D. Gould Company is a family-owned business. It’s been around since 1951. They make solenoid valves. It’s really hard to get excited about solenoid valves unless maybe you are an engineer but, according to the client, a lot of engineers don’t think about them as much as they once did. They are one of those things that don’t seem very important but they are. A bad valve can shut down an entire line. And that’s what happened to the an unnamed American Car company back in 1950’s. At 2 am, the Gould family was awaken by an extremely upset plant manager. He told Mr. Gould that he better get up there right now and fix his broken solenoid valve. That it was costing the company thousands of dollars because the line was down. He expected Mr. Gould in six hours. The drive from Indianapolis to Detroit. At a fury pace. Mr. Gould got in his car and drove there as fast as he could. He couldn’t figure out how his valve had broken but he was going to make it right. When he arrived, he was met by the plant manager, the heads of the union and a lot of executives. Mr. Gould and the union representatives along with electricians and plumbers climbed separate ladders to inspect the valve. Upon removing the top of the valve, they all could see it was stuck in the open position. Mr. Gould said he couldn’t understand why the valve would do that and asked if there was anything in the line. The union workers claimed there wasn’t along with the plant manager. They cut the valve out of the line. And there, sticking out of the valve, was a plumber’s pencil. Whoever cut the pipe, put his pencil in the valve and forgot it. The valve was stuck open and Gould’s valve wasn’t at fault. But he said nothing. They put it back together. The line was functioning again. Mr. Gould drove home. Next week, the local car dealer of the company called Mr. Gould. They had two new cars waiting for him if he wanted to stop by and pick them up. The owner of the company still tears up thinking about how proud he was of this grandpa. Here’s the other pieces I read. Two blogs. One by Chris Brogan and his struggle with GMAC customer service. And another from Seth Godin on How to answer the phone. Imagine what the car company would have done if Mr. Gould had not picked up the phone or not gotten into his car and drove to Detroit. Would he have gotten more business? Even after they found out it was their own problem. Would the lack of care overridden the problem? Marketers complain to me about how the companies don’t understand what they do and how they are always the first to go when economies get tough. I sympathize. I was once on that side as well. Marketers also understand how when a new customer comes calling, you better get it right and answer the phone on the first or second ring. You treat those new customers like gold. But current customers, heck, that’s not your problem. That’s customer service. That’s a different department. Well, it shouldn’t be. Marketers – the new marketers – should handle both sides of the fence. If a call comes in, whether it’s a brand new customer or your oldest, they should be handled the same way. Like the gold they are. Every marketer knows that a current customer is 10 times less expensive to keep than to try an earn a new one. But yet they get the crappy phone calls from overseas or the phone tree from hell. Or nothing. Want to save job your job? Then take responsibility for every customer. Use those marketing dollars to save your current customers from phone trees and incoherent operators. Use some more by giving your current customers an EASY way to spread the word about how great your company is. And you better do it soon. Because customers are starting to realize that they have more firepower with social media. They can organize and spread the word for you or against you. Who knows…there may be a new company car waiting for you instead of a pink slip.